Salalah is the capital city of Oman's southern Dhofar region. It is the second largest city in the Sultanate, and has the distinction of being the Sultan Qaboos' birthplace. For most visitors, Salalah is the gateway to Oman’s most southerly governate of Dhofar – a historically independent, and culturally and ecologically unique region. As the traditional regional capital, the city’s history stretches back two millennia, when, thanks to its strategic location, it was an important stop on the frankincense and silk trading routes. In the 19th century the region was incorporated into the Sultanate of Muscat and Oman, and Salalah served as the country’s capital from 1932 until the accession of Sultan Qaboos in 1970, who relocated the capital to Muscat. Salalah was the Sultan’s birthplace in 1940, and his mother was a member of a prominent regional Jebbali tribe; to this day the Sultan maintains close ties to the city. Today Salalah is still known for the cultivation and trade of frankincense (albeit now on a smaller scale), and is famous for its summer khareef (monsoon) and annual Salalah Festival, when visitors flock to the region to escape the blazing hot temperatures elsewhere on the Arabian peninsula. As lodging and eating establishments outside the city are scarce, it serves as a useful and interesting base for travellers wanting to explore the wider area at any time of year. Maria Dekeersmaeker, The DNA of Salalah, Dhofar: A Tourist Guide. Written by a Belgian journalist based in Salalah, this unusual book is a treasure trove of facts and history, organized thematically. Most visitors come to Salalah during July and August to enjoy the annual khareef, when the nearby wadis are full of water. Occasionally streets flood, and ocean currents are too strong for swimming or diving. The crowds leave in September along with the rains, but the vegetation is still green, and hotel prices have started to come down. Diving is only possible during the dry season, from October to the end of May, and this is also the optimal time for bird watching. May and especially June are the hottest months of the year, with humidity steadily increasing until the rains bring relief again in late June or early July. Oman Air. Flies from Muscat to Salalah at least three times a day, with a flight time of 1hr 30min. Operates direct international flights from Dubai W-Sa, with a flight time of some two hours, as well as to Jeddah Th and Sa, with a flight time of 2hr 50min. Air Arabia. Flies from Sharjah on Su M W Th, with a flight time 1hr 45min. Qatar Airways. Operates direct flights from Doha 3 times daily, with a flight time of 2hr 10min. Beware, the taxi from the airport is 10 or 20 times the normal taxi rate. Driving to Salalah from Muscat takes roughly 12 hours, and can either be an amazing and memorable experience, or a very uncomfortable one depending on what kind of traveller you are. The first 5 hours are very scenic, as you pass Rusayl, Nizwa and other small towns. However, it's barren desert and oil fields for most of the remainder of the trip, with the only larger settlements along this stretch being Haima and Thumrait. Travelling at night is usually better than driving in the heat of day (arriving in Salalah at night is a must, as the city lights from the high-altitude entry point are gorgeous). Watch out for renegade dunes on the way. There are several stops along the way for food, drinks, a cigarette break, or nature calls – you should take every opportunity to stop, as there might not be another one for many more kilometres. 17.01887454.0984151 ONTC Bus Station (next to the New Souq / Central Market), ☎ +968 23 292773, fax: +968 23 202721, e-mail: info@ontcoman.com. Oman National Transport Company runs buses to/from the Ruwi station in Muscat three times daily, with the trip lasting 12 hours. RO 6 (one-way), RO 11 (return). Bus transport to/from Muscat is also offered by Malatan Trading (As Salam St, tel. +968 23 211299) and Bin Qasim Transport (tel. +968 23 291786), both with identical fares. There is at least one operator in Muscat that will charter you to Salalah. Cruise ships stop regularly at the commercial 16.946754.00352 Salalah Port, west of the city. Shuttle buses transport visitors from the ship to the port entrance, and taxis are also available. Visitors need to bring only their cruise boarding pass and their Tourist Entry Permit. 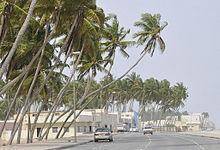 It is possible to explore parts of Salalah on foot, as most places of interest are close to each other. During warmer times of year, though, walking may not be the best idea. The usual unmetered Omani taxis operate here, with the average taxi fare for travel within the city 500 baiza. If you hire a car, 2WD cars are adequate for most sights within Salalah itself. Outside of Salalah, however, many places of tourist interest lie off road, and SUVs are recommended particularly during the khareef season because of slippery terrain. Book your car well in advance if you plan to visit during this peak period, as rental agencies often run out of vehicles. The old city is confined to the area called Al Haffa (Hafah), on the seafront. 17.00692954.1324331 Al Baleed Archeological Park, As Sultan Qaboos St, ☎ +968 23 303577, e-mail: incense@omantel.net.om. Sa-W 9AM-2PM, 4PM-8PM; Th-F 4PM-8PM. A UNESCO World Heritage Site, these extensive ruins were once the 12th-century trading port of Zafar, visited by Marco Polo in 1285. RO 2 (includes admission to the Frankincense Museum). 17.00943354.1360852 Museum of Frankincense Land, As Sultan Qaboos St (on the grounds of the Al Baleed Archeological Park), ☎ +968 23 303577. Sa-W 8AM-2PM, 4PM-8PM; Th-F 4PM-8PM. This excellent museum has displays on the history of the port and of the region. Admission included with Al Baleed entrance fee. 17.02254454.0865933 Salalah Museum (in the Salalah Cultural Center). Sa-W 8AM-2PM. This museum houses an eclectic collection, with sections devoted to regional geology and history. There is also a permanent display of Wilfred Thesiger's photographs. Free. 17.02509854.1117844 Burj an-Nadha (Burj al-Nadha, Clocktower). The clocktower may not be a sky-scraper but it is indeed the icon of Salalah, featured in the coat of arms of Dhofar Governate. The tower looks stunning during nights due to the colorful light display. 17.02168254.1113765 Tomb of Nabi Umran (Tomb of Nabi Imran), Al Matar St (next to Lulu Hypermarket). Umran (Imran) was a local Arab prophet, believed by some to have been the father of the Virgin Mary, and believed by others to have been the father of Moses. The sarcophagus is 33 m long. Visitors should remove their shoes before entering, and women should cover their heads with a scarf. Free, tips gratefully accepted. 17.01721954.0938036 Sultan Qaboos Grand Mosque, 23 July St and An Nahdah St. Sa-Th 8AM-11AM (for non-Muslims). Completed in 2009, this mosque can accommodate 14,000 people. Conservative dress required; women must have their ankles, wrists and hair covered. 16.99976854.0993347 Sultan Qaboos Palace, Al Bahri St. Sultan Qaboos was born in a fortress at this location, which is now the grounds for a modern palace. It is not open to the public, but tourists may photograph it from the outside. 17.00169754.1142048 Traditional Dhofari houses, Al Bahri St (along the coast). To see some older Yemeni-style architecture, drive east on Al Bahri Street along the beach. 17.01858154.1193529 Footprint of Prophet Saleh's Camel, A Daqah St. A shrine housing the footprint of an enormous camel in the bedrock. According to the Quran, the camel was said to have appeared from nearby mountains as a miracle, yet was killed three days later by unbelievers who refused to recognize the Prophet Saleh. In punishment a severe earthquake was said to have destroyed the entire city and its inhabitants. As in other religious sites, visitors are requested to remove their shoes and women should cover their hair. Free. 17.00354.10183310 Gun Souq, As Sultan Qaboos St. A small informal open-air market for vendors selling all types of weapons, from antique rifles to traditional knives and daggers. Best in the early morning. Salalah Tourism Festival (Salalah Festival / Khareef Festival). Jul-Aug. Held annually during the khareef period, this festival celebrates Dhofari culture and traditions with food, music, and entertainment. 16.99991254.0672331 Khawr Salalah (As Sultan Qaboos St and Al Khawr St). Nov-Apr. Avid birdwatchers can find many species of birds within the city itself, as this lagoon is noted for attracting flamingos, ospreys, and many migratory birds. Bring your binoculars. Free. Extra Divers Salalah (in the Crowne Plaza Resort), ☎ +968 92 873560, e-mail: salalah@extradivers.info. 4PM-6PM. Organizes guided tours for diving and snorkeling, and conducts a full range of PADI courses. Most of their dives take place outside of Mirbat, where they also have a dive centre. The centre is closed during the khareef from the end of May until 1 October. SubAqua Dive Center (in the Hilton Hotel), ☎ +968 9989 4031, +968 9989 4032, e-mail: salalah@subaqua-divecenter.com. Offers full dive packages in the waters by Salalah as well as by Mirbat. Offers PADI courses. Most residents speak some English, but if you know a bit of Arabic and Malayalam then conversation will be much easier. Frankincense is the souvenir purchase in Salalah, and only visitors who avoid shopping will not be offered some. Frankincense is available in several different grades differentiated by colour, the lightest considered to be the highest quality and the costliest. Hand-crafted incense burners made of local Dhofari clay are also good purchases. Myrrh is relatively easy to find as well, as are the myriad Omani perfumes on offer throughout the country. You can also buy a khanjar, the traditional Omani dagger. 17.02304754.0935671 Handicraft Souq, Tatawur St and Al Marqaz At Tijari St (near KFC). Sa-Th 9AM-1PM, 4PM-10PM; F 4PM-10PM. A good place to pick up traditional hand-crafted items. 17.01847154.0994463 New Souq, 23 July St.
17.02403754.112154 Family Book Shop, Al Matar St (in Assafa House). Has books in English and Arabic, and a good selection of maps. 17.01316754.0947575 Goal Sports, As Salam St (opposite HSBC Bank), ☎ +968 23 296624. Has outdoor sporting goods, including camping supplies. 17.01227554.0749526 Al Isteqrar Hypermarket, Al Fayha St. Groceries are on the ground floor, and a food court upstairs. 17.02600154.0916369 Spinney's, An Nahdah St (by the An Nahdah Roundabout). Small supermarket with international food. If you decide to visit places outside Salalah city (good advice for traveling anywhere in Oman), remember to carry some food packed for emergencies (fruits, fruit juices, sandwiches recommended) as there are few restaurants outside the city. Always carry several bottles of drinking water since you may not find any store on the highways. There is, however, a delightful ocean-side cafe on the way to Mughsayl and the tidal geyser there. Al Kutaini Restaurant, 23 July St, ☎ +968 23 294179. Offers a wide range of continental dishes but specialize in Pakistani cuisine. 17.01530154.0902311 Annapoorna Restaurant (Al-Saf Saf), Al Ferdows St (off of 23 July St). A traditional South Indian Restaurant serving only vegetarian food. 17.01695354.0968454 Cascade Tandoori Restaurant, 23 July St (near Bank Dhofar), ☎ +968 23 288233. Daily 11AM-3:30PM, 6:30PM-12:30AM. Offers a large range of Indian dishes, particularly well-known for their vindaloo. 17.01561954.0942655 Chinese Cascade, 23 July St, ☎ +968 23 289844. Chinese restaurant offering decent food. No buffet. Chopsticks, 23 July St, ☎ +968 24 783384. Indian-styled Chinese restaurant with decent food. No buffet. 17.0858354.0711437 Ittina Cafe, Atin Rd (on the road to Ittin-Garziz, turn right at the second roundabout, about 10 min drive from Salalah), ☎ +968 9814 1067. Offers decent food and an excellent view of the city. 17.02361154.0931828 KFC, Ar Rubat St. American fried chicken, sit-down restaurant and drive-through. 17.01154.088510 Pizza Hut, As Salam St. Always an option for any Americans wanting a taste of home, delivery available. 17.01820454.10211611 Baalbeck Lebanese Restaurant, 23 July St (near the main market), ☎ +968 23 298834. A small family restaurant serving very good Lebanese food. Has excellent hummus, tum and shwarmas. 17.01080554.08714112 Browniz Coffee House, As Salam St (across from the Salalah Cemetery), ☎ +968 23 297575, fax: +968 23 298787, e-mail: info@browniz-coffeehouse.com. This cafe/restaurant offers a good range of European food. Free wi-fi. 17.03841954.10687413 Good Hopes Restaurant (formerly Woodlands Restaurant) (in the airport). Surprisingly one of the better restaurants, licensed. 17.00530354.06078314 Lebanese House Restaurant, Al Salaam St (Bait Lubnan), ☎ +968 23 212100. This restaurant offers good Lebanese food at a reasonable price (RO 10 for 3 people - starter & main incl. 1 drink each). Delivery available. 16 Ajwa, 23 July St (near Bank Dhofar). Offers Pakistani and Hyderbadi food. No buffet. The restaurants located in the Hilton, Crowne Plaza, and Juweira Boutique hotels offer high-end dining services, with both à la carte and buffet options. For romantic dining, beach pavilions can be reserved at both the Hilton and Juweira Boutique. There are many roadside stands selling fresh fruit juice and coconuts. Alcohol for non-Muslim visitors is available at high end hotels like Good Hopes Restaurant in the airport and Oasis Club near the port, as well as at the bars in the Crowne Plaza, Hilton, and Juweira Boutique hotels. For a refreshing drink, stop at any of the many roadside vendors selling fresh coconut. They will lop the top off a green coconut for you for 200-300 baizas. During the annual khareef from July-September the population of Salalah balloons with visitors from elsewhere in Oman and the Persian Gulf, so if you plan to visit during this time it is essential to make reservations well in advance. During other times of year rooms are plentiful and rates are more reasonable. 17.01965654.110171 Al Hanaa Hotel, 23 July St (across from Lulu Hypermarket), ☎ +968 23 298305, +968 23 290274, e-mail: alhanaa@omantel.net.om. Within walking distance of downtown. 17.0090154.158762 Arabian Sea Villas, Dahariz Beach (near the Crown Plaza Resort), ☎ +968 23 235833, fax: +968 23 235830, e-mail: seavllas@omantel.net.om. An Omani-Belgian enterprise located directly on the beach of South Dahariz, adjacent to the coconut groves. This is one of the best budget options in Salalah; rates include breakfast and wifi (available in the breakfast/coffee room). Note: it is best to book a room directly by email or telephone, as the booking service on the website caters to German tour operators, with significantly higher nightly rates. RO 30-40/night. 17.00881754.1512863 Crowne Plaza Resort Salalah, Dahreej, ☎ +968 23 235333. Check-in: 2PM, check-out: noon. A better alternative for luxury accommodation as the property is much larger than the Hilton and more importantly it is close to the city centre. RO 72+/night. 17.0172554.1100954 Dhofar Hotel, Al Matar St (near Lulu Hypermarket), ☎ +968 23 292300, fax: +968 23 294358, e-mail: dhfhotel@omantel.net.om. The hotel offers basic accommodation at very affordable prices. Located in the city centre it is a convenient option for those who are not looking for luxuries or a beach-facing hotel. Service is very friendly and hotel is reasonably clean. €80/double. 17.01887154.0596836 Hamdan Plaza Hotel, Al Wadi St (across from Lulu Hypermarket), ☎ +968 23 211025. Free breakfast with wi-fi. 17.0089454.158097 Salalah Beach Villas, Ad Dahariz St, ☎ +968 23 235999, e-mail: beachspa@omantel.net.om. Located directly on the beach. RO 30+/night. 17.00881754.1512868 Crowne Plaza Resort Salalah, Dahreej, ☎ +968 23 235333. Check-in: 2PM, check-out: noon. A better alternative for luxury accommodation as the property is much larger than the Hilton and more importantly it is close to the city centre. RO 72+/night. 16.98136154.0153849 Hilton Salalah, As Sultan Qaboos St, ☎ +968 23 211234, fax: +968 23 210084. Check-in: 2PM, check-out: noon. A popular choice for European visitors. It is located roughly 12 km outside the city and runs a daily shuttle service to and from the Gold Souq. However, the hotel cannot really be recommended as the service is appalling and a general sense of "the inmates running the asylum" pervades. RO 59+/night. 17.03146454.29971710 Juweira Boutique Hotel, Taqa Rd (Marina Town), ☎ +968 23 239600, fax: +968 23 239622. From Juweira you can get a clear view of the artificial 'Juweira Island' which is spectacularly illuminated during night. There are many wonderful cafes, lounges and restaurants in Juweira. There is also a fashion boutique and a children's play area. RO 65+/night. Mobile coverage using Oman's providers is close to flawless, but roaming can sometimes be slow. There are several internet cafes around town, but speeds are inconsistent. Prices vary, but are usually cheap. Salalah is a very safe place. However, the Salalah (Arab) way of driving might need some getting used to for non-Arabs. Don't go swimming in the sea or permit toddlers/children to wander off at beaches. The sea has very strong ocean currents and the seabed has a steep drop off, making it very unsafe for swimmers, experienced or beginner. Remember to carry your passport and visa papers with you wherever you go, at least photocopies, as you can expect local police or military patrols to check on you when you least expect them to show up, even if you are within city limits (it is just a routine procedure to check for illegal workers and immigrants). It's advisable for women to bring conservative clothing, especially if travelling outside the city. A general rule is to keep shoulders and knees covered. Western swimwear is acceptable on private hotel beaches, but not on public beaches where one-piece suits, or even tshirts and swimming shorts, are preferable. Keep a sarong handy. Bring plenty of water and sunblock if travelling outside the city. 17.11190253.99384811 Job's Tomb (An-Nabi Ayyub) (30km northwest of Salalah off of Atin Rd). Believed by many to be the tomb of the biblical figure Job, on a hill-top overlooking Salalah. There is a small restaurant nearby with wonderful views. 500 bzs. Taqah is 35km away on Highway 49, and Mirbat is an hour's drive. To the west is Mughsayl with its famous blowholes, and some dramatic coastline (see Itineraries in Dhofar). This city travel guide to Salalah has guide status. It has a variety of good, quality information including hotels, restaurants, attractions and travel details. Please contribute and help us make it a star! This travel guide page was last edited at 12:52, on 15 January 2019 by Wikivoyage user Traveler100bot. Based on work by Wikivoyage users StellarD, Wrh2Bot, Ikan Kekek, JoannaJames and Ground Zero, Wikivoyage anonymous users 85.154.170.12, 5.162.22.200, 213.130.119.58 and 188.140.132.76 and others.